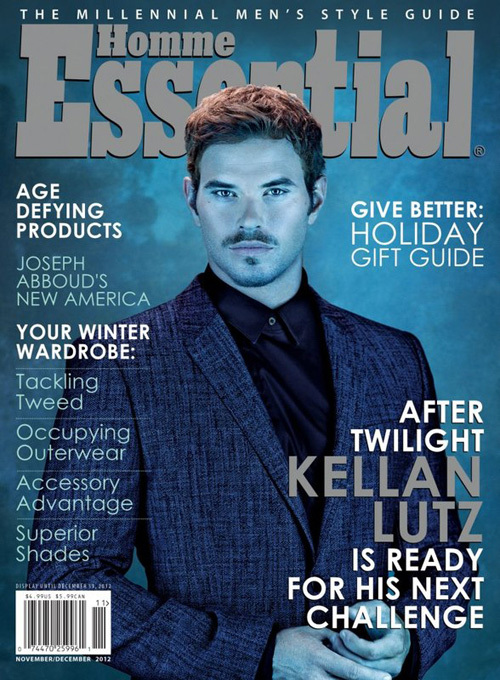 Twilight's Kellan Lutz photographed by Randall Slavin for Essential Homme‘s November/December 2012 issue. Here is what the 27-year-old Twilight hunk had to share with Essential Homme. My dad lost his hair when he was younger, so I knew I wasn’t gonna be pretty enough or handsome enough to model for the rest of my life. I never did theater growing up, I never did anything in front of the camera. But I liked it. I learned a lot about myself doing it. And then I realized—I have more personality than I have looks. Modeling you can’t really express your personality, but in film you can. It’s one of these roles in my life that I’ll always remember. But I’m ready for something new. Would I do more movies if there were more books? Of course! I love my character so much. I love working with all these great directors. I love our cast. I’m a stocky guy and I played football growing up. And I don’t do yoga. I’m not very flexible or agile. With Tarzan, it’s like taking ballet class. Picture a football player taking ballet class!